From glitzy gala balls, to the classic New Year’s Day ‘dook’, we know how to celebrate New Year in Dundee! Read on to find out how to make the most of your Hogmanay. The Jute Café Bar are hosting local band, The Broon Troot Orchestra. As well as a cracking three course meal, a piper will help you see the bells in, and then their resident DJ will keep you dancing until the early hours. Tickets are £52.50 per person. Bring in the New Year at our glittering Hogmanay Gala Ball. Our piper will see to it that you have a proper Scottish welcome. Drinks and canapés begin the night, followed by an amazing course tasting menu. After dinner entertainment will see you into the New Year. Tickets are £95 per person and include a half bottle of wine, view the full tasting menu online. The party doesn’t stop there – join us on New Year’s Day for more fine dining and dancing. Our New Year’s Day supper coupled with live entertainment is just what you need to start 2017 off with a bang. Tickets are £45 per person. Not one for the faint-hearted, this New Year’s Day tradition dates back to the 1800s. 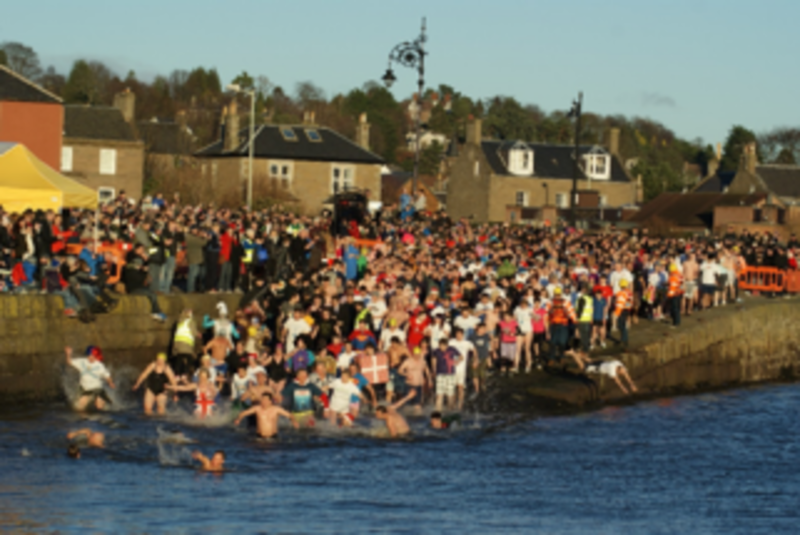 Each year, hundreds of brave Scots head to Broughty Ferry beach on New Year’s Day to take a ‘dook’ in the chilly waters of the Tay, often in fancy dress. For those not so keen on taking a dip, the dookers are always pleased to have spectators cheering them on. Finally, no matter what you’re doing, you’ll want to make sure you’ve got somewhere to rest your head at the end of the night. Book our New Year Breaks offer and you will enjoy a continental Champagne breakfast on New Year’s Day, plus a £10 voucher to spend in the hotel, only when you book direct. Is there a better way to start 2017?